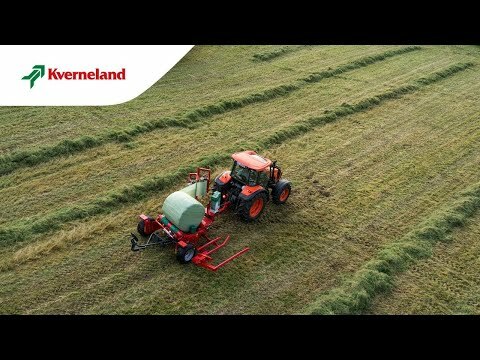 The Kverneland 7730 is a trailed wrapper designed for smaller tractors. The machine is very easy to operate; even the mechanical version offers fully automatic cut and tie of film. Kverneland 7730 models has a new feature DuoWrap twin film pre-stretcher. The hydraulically operated loading arm is positioned on the right hand side and can handle bales from 1.20 m up to 1.50 m diameter. Kverneland 7730 M is cable controlled and fitted as standard with a bale and wrap counter with AutoStop function. On the Kverneland 7710, 7730 and 7740 a hydraulically operated film cutter cuts and holds the film in position ready to wrap the next bale. The DuoWrap sees twin film dispensers integrated into the Kverneland 7710, 7730 and 7740 mounted and trailed turntable wrappers. DuoWrap gives up to 50% faster wrapping compared to single film models, whilst also reducing the risk of film breaking during wrapping. Utilising a 66% overlap of the two films as they are applied to the bale, DuoWrap ensures even coverage without excessive wrinkling of the film. The Kverneland 7730 and7740 are designed with a low table height and wheels located at the very rear of the machine. The position of rear wheels ensures a low table height provide low loading and unloading height. The low slung chassis combined with a short lifting height, provides fast transfer of the bale from arm to turntable. 1) The low mounted table design allows higher rotation speed an. 2) The short lifting height provides fast transfer of bale from arm to turntable. 3) It ensures vast and gentle on-the-move unloading with no need for a fall damper. The clever design of the frame with its extendable wheel arm on the right hand side allows an increase in track width on the field for maximum stability during loading of bales. This allows bales up to 1 ton to be loaded without any counter weights on the machine.